elemIDs = findElements(mesh,'region',RegionType,RegionID) returns the IDs of the mesh elements that belong to the specified geometric region. elemIDs = findElements(mesh,'box',xlim,ylim) returns the IDs of the mesh elements within a bounding box specified by xlim and ylim. Use this syntax for 2-D meshes. 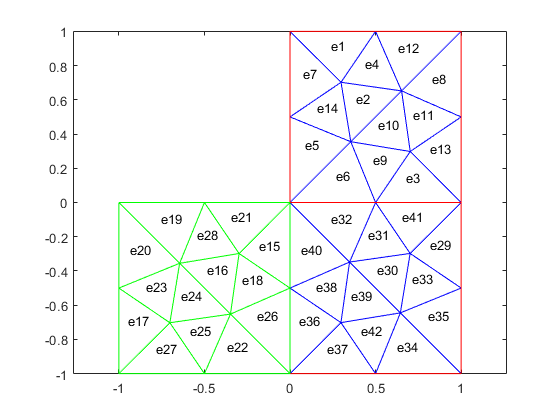 elemIDs = findElements(mesh,'box',xlim,ylim,zlim) returns the IDs of the mesh elements located within a bounding box specified by xlim, ylim, and zlim. Use this syntax for 3-D meshes. 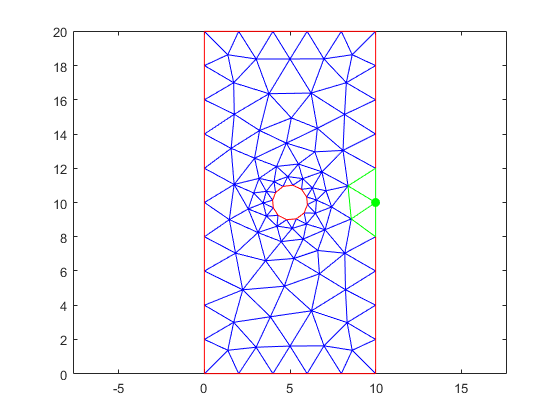 elemIDs = findElements(mesh,'radius',center,radius) returns the IDs of mesh elements located within a circle (for 2-D meshes) or sphere (for 3-D meshes) specified by center and radius. elemIDs = findElements(mesh,'attached',nodeID) returns the IDs of the mesh elements attached to the specified node. Here, nodeID is the ID of a corner node. This syntax ignores the IDs of the nodes located in the middle of element edges. For multiple nodes, specify nodeID as a vector. Find the elements located within a specified box. Find the elements located within the following box. Find the elements located within a specified disk. 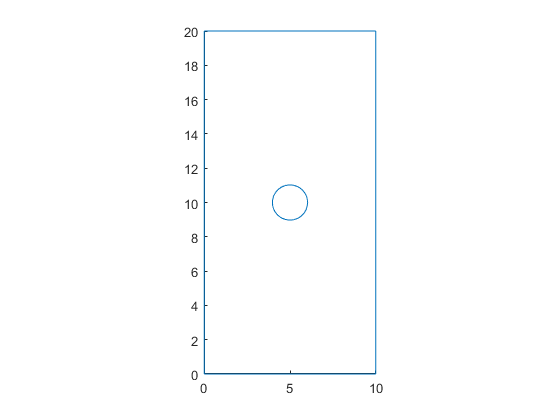 Find the elements located within radius 2 from the center [5,10]. Find the elements attached to a specified corner node. 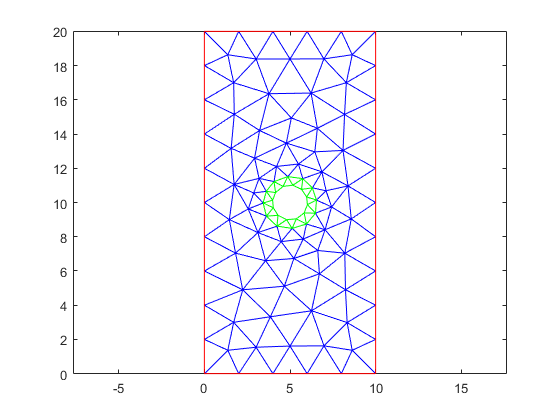 Generate a linear triangular mesh by setting the geometric order value to linear. This mesh contains only corner nodes. Find the elements attached to this node. 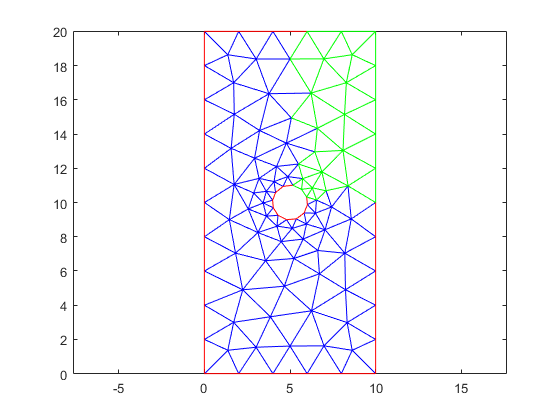 Highlight the node and the elements in green on the mesh plot. Geometric region type, specified as 'Cell' or 'Face'. 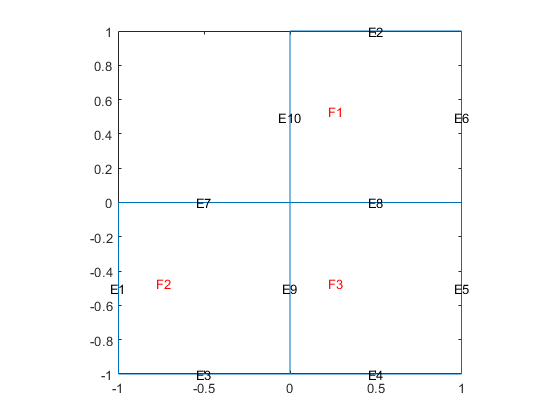 ID of the corner node of the element, specified as a positive integer or a vector of positive integers. The findElements function can find an ID of the element by the ID of the corner node of the element. The function ignores IDs of the nodes located in the middle of element edges. For multiple nodes, specify nodeID as a vector. Element IDs, returned as a positive integer or a row vector of positive integers.